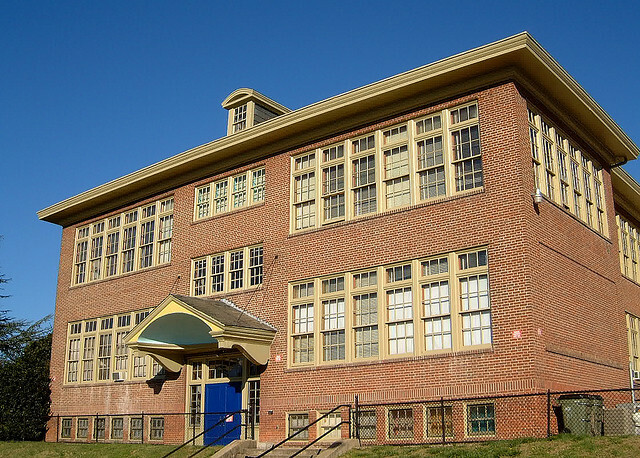 The Richmond Public Schools site has a short history of the Robert Fulton School building at 1000 Carlisle Avenue. Named for the community in which it was located and for the American inventor, Robert Fulton. The community is believed to have derived its name from the Fulton family which at one time was prominent in the area. For a number of years, the principal of Robert Fulton had supervision over the Indian School and Webster Davis School. Mechanical improvements (heating) were made in 1955. The enrollment declined at Robert Fulton as col ored families moved into the area between the hill and the river. When the last white school on Church Hill was closed in January 1969, the pupils were transferred to Fulton. Fulton closed in June 1979; it was declared surplus to the City, August 1, 1980. The building was subsequently purchased by a citizen (Russell Garber) who converted it into an arts center. I originally posted this on the now all-but-defuct Greater Fulton News in November 2007. It caught some great comments over a few years, which I’ve pasted below for posterity. I attended Robert Fulton Elementary School from kindergarten to 5th grade (1971 – 1976). I often wonder what happened to some of my classmates. One bully in particular, that in this day & time would be in juvenile detention center for extreme harrassment and assault on several students including myself. We frequently had a substitute teacher in English, who effected me greatly with her wisdom, fairness and would not put up with unruly students. I wish I could remember her name. As I get older, I look back at my school days at Robert Fulton. I can remember the May Day Festivities on the front lawn and recess time on the playground as if it were yesterday. The cafetaria had the best peanut butter cookies ever. The math education was not very good. When I was in 5th grade and my dad realized that I could not tell time and had to count on my fingers to do math (which I still do), he put me in a private school. I had to take a test to get into that school and the only thing that saved me was my reading ability. I have always loved to read. Being curious, I googled Robert Fulton and this little bit of history came up. I attended Robert Fulton from K to 5th grade (1964-1970). I remember the fun fairs, easter egg hunts on the front lawn, playing on the large playground, the Christmas play, going down into the basement for music class, and I loved those huge collumns in the front. I only lived three doors down so I could go there in the evenings and play. I used to love watching the bats circle the top of the building in the late evening. I even still have my school class picture from 1970. A lot of memory I’m glad it’s still standing. I attended school in 1942. We lived with the Henry Garbers, Lily Hill and Tilly Gill ?? at 5102 Montebello circle. My father was stationed at the Air Force Base……We built tree houses, fished brickyard lake…I may have my old report cards…..
I’m glad the school is still there!!!!!!. I heard of an open house next Sat. maybe for past students? Any info? Fulton Hill Properties owns & manages the school and has their offices there. You may want to contact them and see if they’ll let you see the space. I started Robert Fulton in 1960. I’ll always remember the annual Christmas Nativity Pagent, the May Day Celebration, the “end of school year” picnic at Powhatan playground, and of course the “Hut”. I’ll also remember those wonderful teachers; Mrs Bowles, Mrs Jennings, Mrs Redford, Mrs Parrish, and Mrs Bevil to name a few as well as the principal, Mrs Wright, Mr “Willie” Williams, the school custodian, and lastly Marie and Coreen who worked in the kitchen. Some of my teachers had even taught my parents years ealier. I was greatly relieved to hear that that great old building had been given a second chance as an art center. I knew that Robert Fulton was being used as some sort of art center, because my sister, Rae, and I attending an open house there a number of years ago. I attended Robert Fulton 1959-1966. Thanks to Ricky Colgin for reminding me of some of the the staff and teachers’ names. Hey, Ricky; remember me? What was the school guard’s name? I attended Robert Fulton for one year prior to its closing. From there I attended St. Patricks elementary. I was always curious as to why the school closed. I had always wished that I had finished out my elementary school years there. It amazes me how only spending my kindergarten year there had left an everlasting impact on my life. I found this website today and couldn’t belive my eyes. I attended Fulton from 1972-77,I didn’t finish there.I went to St. Patricks for 5th grade. I would have loved to go to a reunion. After all these years I remember that school and fellow students more than the people I went to High School with.I started remembering teachers names I hadn’t thought of in years,Mrs. Ranchbaren, Ms. Thompson, Mr.Johnson. Kids I knew back then. Going to the fire house after school and getting pop. It was great thinking of those times. I would love to stay in touch. well, i attended webster davis in the bottom…there were a few of my black friends whom i remember attended fulton school..
but i do remember the cobbled stone streets at the bottom of the hill. and going to the top where the front of the fulton school was an adventure for us in the bottom. i remember strawberry..cat who loved baseball. Memories from the past! I remember those teachers and also others – Mrs. Cosby, Miss Blackwell. I remember a milk truck running over a girl’s foot one day. Walking to and from school, going to the Hut, the playground. Hadn’t thought of all this in years. I attended in the mid 50s. I attended Robert Fulton from first grade through seventh I believe (ok, getting old so the memory is going!). I see my sister, Jan, has posted here as well. I can vividly remember the teachers’ names mentioned. I remember on rainy days having to go down in the basement (the dungeon)…I remember walking past heating equipment, etc – which was scary to me! I DO remember a few bullies as well, but my best memories are of the cafeteria. Mrs. Blackwell was my first grade teacher, I remember the principal (oh, forgot her name – but can see her face) playing “You’re too Dangerous, Cheree” on her stereo..buying mild in the little carton, spaghetti always seems to be served with green peas….such wonderful memories! I was a student a Robert Fulton during my elementary school years. The year I completed 5th grade, which was as far as the grades went when I attended, the school closed. I recall when you drove down Broad St.through Church Hill and you could look over and see Fulton school sitting there,nothing else around it. Robert Fulton has a place in my heart as well! My parents, Lucille Hutchison Nelson and Kenneth D. Nelson attended, as well as my brothers Doug and Steve, and sister Nancy. I went 1st thru 7th grades. Some teachers also taught my parents, like Ms. Chorning (sp.? ), Ms. Snell and Ms. Parrish. My teachers in order were Helen Redford, Ms. Taulman, Ms. Cosby, Ms. Dewberry, Ms. Beville, Ms. Crocker and Ms. Pence. I did go to an open house several years ago, and the school seemed to have ‘shrunk inside’- LOL. A couple of the aforementioned teachers were present, as well as “Fulton Hiller’s” I had not seen in years. I am so glad the beautiful building is still there, and the neighborhood is on its way back up! I too attended Robert Fulton Elem. It was the first school I ever attended and I was so excited that first day. The campus was so beautiful. Ms. Jennings was my K and first grade teacher. I probably started in 1967 and was there when Webster Davis and Robert Fulton were desegregated K through 3rd stayed at Robert Fulton and 4 – 6th went to Webster Davis. Robert Fulton had great fairs. One year Sailor Bob was there, remember him, and my sister and I had a picture taken with him. Remember the monkey bars that were shaped like a rocket. One year I fell off of them and had to have three stitches in my chin. I still have the scar but it is one of those scars that brings back wonderful memories. We would walk home from Robert Fulton and stop at the Fire Station. They had a place where you could buy candy. Then I had to go to Webster Davis and I remember the coolest little candy store across the street. We could buy 25 pieces of candy with a quarter. They also sold guppies and boy could they produce. We would buy two and then have to increase our aquarium size to accommodate the population. I realize it was a time of great debate among our parents because they did not like the idea of “mixing us kids up” but for me it was a wonderful experience and I have great memories from it. They just don’t make schools like that anymore with so much style and history! I went to Robert Fulton 49-54. Mrs. Blackwell was my kindergarden and 1st grade teacher (altho back then it was called Jr. Primary and Primary then on to 2nd grade). I remember dressing up for our May Day celebration. I believe Mrs. Cosby was my 2nd grade teacher and Miss Crumpler was my 4th grade teacher. I remember she went to the coronation of Queen Elizabeth (don’t know how she managed the invite). Back then, down from the school was all red clay and was known as Clay Hill. There was also stories of it being Indian territory and I believe human bones had been found. I remember going to the Quanset ‘Hut’ and learned tap dancing and acrobats. Sometime during the early 80?s I went back to Richmond and wanted to see the school. It was closed down then with weeds growing up all around it. It was a big disappointment. Would love to find some of my old classmates from there. To add to my previous post of 8/12/10 .. does anyone remember the following names? We all went to Robert Fulton in the early 50s.. June Padgett (lived on Garber St), Dorothy Tyree (lived on Denny St), Linda Lou Bowles (Garber St)or Elsie Allen Fulton St)? Hi Dorothy. I remember you. we were in the same grades together. Talking about the red clay hills; I remember the old house that used to set atop the red clay hill (no lnger there) just across from the school. At recess we played games on that hill running through the roots that judded out from the hillside. My mom had to wash my pants every day. We also played a lot of kich ball on the asphalt out back. And when it rained, we were stuck in the basement for recess. The teachers I remember was of course Mrs. Blackwell, Crumpler, Bevell. But my favorite was Miss Painter. She told the greatest stories ever. I still recall Stanley Dalton, Donald Carver, Alice Taylor, Roger Miller, Dorothy Tyree, June Padgett,Kirby Getman, Linda Bowles, Elsie Allen, Robert Mayer, Alvin Miller and of course, you! I cherish those days. I still have dreams at times walking through the school and going up and down both stairways at each end. I have chosen not to go back because I want to remember the place just like it was; especially the auditorium where we paid a dime after school to watch a movie and had our plays and finally our graduation. And the front lawn…..for our May Day celebrations. I remember all and all of you so well. I am retired now and have a 6 year old son. I hope he has the experiences great times with his first friends as I did. Thank all of you for the memories. I started at Robert Fulton in 1960 in Junior Primary 1 (that’s what they called kindergarten back then). I went through the 5th grade and then I moved to Chesterfield County. I have fond memories of Mrs. Jennings, Mrs. Redford, Mrs. Parrish and Mrs. Snell, who also taught my aunt. I also remember the ‘end of the school year’ picnics on Powhatan Hill and the Christmas pagents. It was at Robert Fulton that my family and I attended the clinic to receive the polio vaccine. I would love to take a tour before I get too old to climb all those stairs! I started at Robert Fulton in 1957 and went throuh the fifth grade, those were good days. My brothers Tom, Ron and Bruce also went there as did my mother Ann. I remember so well the teachers, Jennings, Redford, Parrish, Snell and Willie, we grew up a few doors down from Mrs Parrish on Apperson Street, so we were not far from the playground, the hut and the school. Great Days! Hi Milton, I remember u, too. So glad someone remembers me… lol… I do remember u guys playing in the clay at recess. And I most definately remember those stairs at each end of the hall. Mrs. Blackwell’s room was right by the stairs. One of the girls and I were racing back to the room after going to the bathroom, as we approached the door, she pushed me to get in first and I fell down the stairs and busted open my head. She went in and sat down .. Mrs. Blackwell asked her where I was and she calmly told her I had fallen down the stairs. I remember her coming down, picking me up and carrying me to the principals office. I came across Stanly Dalton’s sister on Classmates.com, but haven’t found anyone else from the school. But from a msg I had posted on one of the Fulton’s websites I got a response form Dorothy Tyree’s daughter. Unfortunately Dorothy died about 30 yrs ago from breast cancer. Dorothy and Elsie had been my best friends. By the way, are u on FB? Would love to b ur frind on there. Thanks for the Fulton post. As the school was named for Robert, the area not so much. I remember Robert Fulton well. It was the second elementry school I attended in Richmond. I lived on Randall Ave down by Montrose Heights playground. There was a rivalry between Montrose and Powhatan playground, we felt that Ms Chapman didn’t like Montrose. I’ll add to Ricky Colgin’s list of teachers naming the ones I had. Miss Adams for first grade Rm 101, Mrs Bowles for 2nd grade, Mrs Redford 3rd grade, Mrs Parrish for 4th grade,Miss Higdon 5th grade a brand new teacher right out of college next to Mrs Snells room at the top of the stairs,and Mrs Pence 6th grade. Mrs Pence died not to long ago at 90+ yrs old maybe 97. Miss Adams and Miss Higdon were young and Miss Gowen was young but the rest of the teachers were older and some were darn mean. People dont like for me to say who but we all know who were the mean ones. Teachers I didnt have but were there when I was there 1st-6th grade 1963- 1968 were Mrs Chornen,Miss Jennings,Miss Gowen, Mrs Dewberry, Mrs Snell, Mrs Bevell and a black teacher Miss Russell that no one seems to remember. She was in the side room between the office and Mrs Bowels room. I didn’ have Miss Kay/Foutz but I remember she came to visit us sometimes, as she was on a sabbatical at a local university. Also Mrs Savage was the cafeteria manager and played Mrs Santa at Christmas time, Mrs Wright was the cashier. Mrs Evans was the Secretary in the office. Mrs Wright was Principle untill I was in 5th grade then Mr Paulette took over. Also remember the ladies in the office who would take over a class if a teacher was late or sick untill a sustitute could come in. They were Mrs Uzell , Mrs Edwards, and Miss Boulheller. Wow what a lot. That is my history of Robert Fulton. Glad to have shared. Oh, and there were no men teachers while I was there. I did get to walk around the first floor back in 2008 when the school was opened up the last time , but not the second floor. The Re union committee said they are trying to have the owner have open house again but no word yet, hope it happens but the second floor is off limits as there is an apartment up there for the owner. Ok I am finished. Robert Fulton was a great school. I had my first music lessons there under Ms. Marsha Meekins. I remember Ms.Brown and Mr. and Mrs Johnson and no they were not married. I remember Ms. Alexander and Mrs. Robinson. She would say to me, “Birds of a feather flock together.” However, back then it did not mean much to me. However,as I grew older and wiser I understood what my teacher was trying to say to me. I remember recess and playing kick ball. I also remember the folk saying about the HORSE MAN and not to walk through the path that led up to the school from where we lived. I recall Mr. Pryor falling down in the basement and busting his head too. I do not know if he died from his injuries but it was serious. I am glad I came across this webpage. I was actually researching some thing and mistakenly found this site. What a plus to read others held fond memories of Robert Fulton too. Glad I took more of the positive things away and not so much the negative. Well I’m back with an update. Robert Fulton is going to be renovated by the owner soon. They are going to put in a cafe and some apartments and the studios will be moved out but will come back after the renovation. There was an open house for the school on Friday 10/27/2017 5:30-900. It was not realey announced well at all. I just happened to see it mentioned in an article in the paper about the Fulton Hill-Montrose neighborhoods one friday in the RTD section. It was nice. I taklked to some of the people that have studios or offices there. They felt that the building would be open in the future to the public. but more important is the second floor was open. I was in heaven. The last time i was there in 2008 the second floor was not open. I got to go in Mrs Snells room and Miss Higdons(my fifth gradeteacher), part of the auditorium and cafeteria. It was nice, hope to do it again. I was there from 1962 – 1968. If any one has any pictures from that time period, please share. All pics I had were lost or destroyed. I had Mrs Chorning for kindergarten, Miss Parrish for fourth grade and Mrs Snell got fifth grade. I remember there was a boy in my fifth grade class who jumped out the window and broke his back! That was also the year that Mrs Snell had a stroke in class. It was a difficult year. I moved away the end of the school year and moved back in 1974 to attend Nursing School at the old St Luke’s Hospital. I sure miss those days on the hill! My name is Hope, and I attended Robert Fulton in 1967. I only went there for a very short while and can still remember the smell of fingerpraint and construction paper. I remember the big art room with the loom and the oven for cooking clay projects. I remember the Windows being open in the spring. I loved it there. I had Mtrs. Chaunon (sp) in Jr. Primary. Karen Nuckles….do you have a brother Jeff? I wish schools were the same now. What a fond memory! Hi there,I log on to your blogs named “A history of the Robert Fulton School – Church Hill People’s News | Richmond, Virginia” on a regular basis.Your writing style is witty, keep it up! And you can look our website about free proxy.